These days, a lot of people are thinking about downsizing from a large, traditional home, to a mobile home, usually located in an enclosed community of similar homes. These places used to be called “trailer parks” and sometimes had shady reputations, but times have changed. Not only have the homes themselves changed, but the reasons for living in a mobile home park have changed. Mortgage payments on your traditional home may have become overwhelming. Retirement funds may have shrunk with the recent stock market woes. Lots of people are tired of paying the high energy costs to heat or cool a large house, and if grown children have moved away, there may be no need for all that room anyway. Today’s Green Revolution may be motivating people to reduce their carbon footprints and help the planet by moving to a smaller house. College students, newlyweds, people just starting out in life—these are just some of the kinds of people who find mobile home living desirable. If you’re looking for a home manufactured any time after June 15, 1976, you’re not looking for a mobile home at all. That term was abandoned on that date, when the U.S. Department of Housing and Urban Development (HUD) created a set of standards known as the HUD Code. This code of standards applies to the construction, design, strength, durability, transportability, fire resistance, energy efficiency, and quality of all manufactured homes. The code also sets performance standards for heating/AC, plumbing, and electrical systems. The idea of a mobile home is not that you can hitch it to your truck and drive it away, because you can’t. It’s costly and complicated to move a manufactured home from one place to another, although almost all of them are outfitted to be moved if necessary. The idea of “mobile” is that the house is manufactured in one place, transported, and then installed in another place. There are several types of these homes. It is a factory-built home that’s built in sections and then transported to the site. It is then lifted and settled onto the foundation and permanently anchored. The homes are built to satisfy only the state, local, or regional codes where the home will be located. Usually means a kit home, a log home, or a dome home, all of which are meant to be assembled on site, possibly by the future owner. Pieces are factory-cut to certain design specifications, transported to the site, and then assembled. A mobile home is any manufactured home produced prior to June 15, 1976. 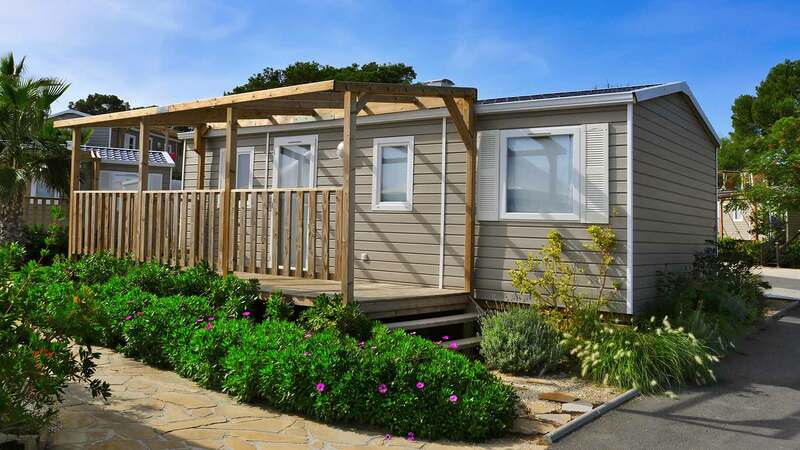 For purposes of this article, we’re talking about manufactured homes that are found in a mobile home park or community setting. These neighborhoods often have identifiable personalities. Some prefer tenants over the age of 55. Some are known as great places for young families with children. Some are definitely upscale and have a long list of rules about what you can and can’t do with your yard and home exterior. And some are downscale, located in poorer parts of town, with residents who are often struggling financially. Of course, these figures are only averages, and tell us nothing about the highest or lowest ends of the price spectrum. For instance, add granite countertops, ¾-inch hardwood flooring, stainless steel appliances, designer bathroom fixtures, and a waterfront location, and you have a $180,000 mobile home. A single-wide home can be no larger than 18 feet wide by 90 feet long, and can be transported to its site as a single unit. Whereas a double-wide is at least 20 feet wide but no more than 90 feet long, and must be transported to its site as two separate units. Once at the site, the units are joined. There are also triple wides and larger, but these are less common. The U.S. Census Bureau reports that in August 2008, new manufactured homes were generally more expensive to purchase in the West and the Northeast, and were least expensive in the South. This is not a constant situation, though, since sales fluctuate with the seasons and the regional economies. Go to the National Automobile Dealers Association (NADA) website to get a good idea of accurate and fair market prices for a particular model and year of manufactured homes. Used manufactured homes vary widely in the type and quality available. You can buy an old, rundown trailer, obviously meant for temporary shelter, for $500 or less. Many repairs will be needed, however: windows, insulation, flooring, and more. Old, poorly maintained trailers are generally a lost cause and the residents often have sad stories to tell. Pre-owned double-wide or triple-wide manufactured homes hold their value better than the single-wide homes do. A well-maintained, pre-owned double-wide can be priced anywhere from $25,000 to $75,000, depending on the year it was built, how well it’s been maintained, and add-ons such as patio, porch, special countertops, kitchen and bathroom fixtures, etc. Before signing any promises or contracts, be sure to hire a professional home inspector who specializes in manufactured homes and is not affiliated in any way with your realtor or mobile home park you’re thinking of moving into. A skilled home inspector can alert you to any potential problems and added expenses you may have to deal with in the future. Other things to think about are proximity to grocery stores, hospitals, schools, and public transportation. Visit the mobile home park at various times of day and night, prior to buying, to see if the noise level or personality of the place changes. Financing for a pre-owned manufactured home is sometimes more difficult to obtain than for traditional housing, and interest rates may be higher. In addition, manufactured homes are not considered real estate; they are considered as property and will be registered as a motor vehicle, even though most of them never move from their original site. Rental space in parks tends to run anywhere from $100 to $1,000 per month. There are some places that charge up to $1,500 a month, but they are unusual. Obviously, the cost depends on location and amenities such as swimming pool, tennis courts, clubhouse, etc., as well as the size of your lot, landscaping, services, and parking facilities. Water, sewer, and trash disposal are usually included, even on the lower end of the scale.